Bernie teams up with Maclay winner, Zazou Hoffman to illustrate his progressive system to develop a solid position for all jumping disciplines. This video outlines exercises that enhance proper techniques over fences, highlighting connection with your release over the jump. This video sponsored by Voltaire Design. Bernie Traurig and his daughter, Natasha, demonstrate correct and safe mounting & dismounting options. Find out which ones suit you. Maintaining a secure balance with your horse over the fence is crucial. In this video Bernie outlines a series of exercises designed to improve your balance & security in the tack - beautifully demonstrated by Maclay winner, Zazou Hoffman. World renowned course designer, Leopoldo Palacios, and Bernie Traurig talk about the always controversial water jump. Equine activities can be hazardous and may subject participants to injury. 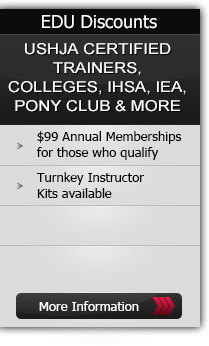 Neither Equestrian Coach, LLC, Bernie Traurig nor Leopoldo Palacios assume liability for your activities. This program provides general instructions and techniques that may not be suitable for everyone. No warranty is given regarding suitability of these instructions to the viewer. Leopoldo Palacios, world famous Olympic & World Cup Finals course designer, shares his insights and philosophies about the challenges he presents to horse & rider when creating his impressive courses. In Part Two of this topic, you’ll get the opinions of several riders and special commentary from Leopoldo and Bernie as the action of the $35,000 Blenheim Summer II Grand Prix unfolds! Leopoldo Palacios, world famous Olympic & World Cup Finals course designer, shares his insights and philosophies about the challenges he presents to horse & rider when creating his impressive courses. In Part One of this topic, Leopoldo and Bernie walk the course for the $35,000 Blenheim Summer II Grand Prix in San Juan Capistrano, California. Bernie Traurig takes the frustration out of missed diagonals. With just a bit of practice, you'll be feeling your diagonals with your eyes closed! In Part 3 of Building Blocks to a Great Position, Bernie Traurig continues his progressive system to develop a solid foundation for jumping disciplines. With demonstrations by his daughter, Natasha, this video outlines exercises that enhance proper techniques.